“…We are not actually an indie-folk band- despite all the beards and bow-ties and banjos. We are a celebration band. It’s just a coincidence that folk music and celebration make a great pairing! This record is an attempt to reflect something of the irrepressible laughter in the heart of God, it’s a call to the cynical to once again choose celebration over condemnation and a reminder to the broken that ‘the joy of the Lord is our strength…” Ever since their ambitious music video “Movements” and subsequent album Organic Family Hymnal in 2010, Northern Irish band Rend Collective Experiment (now known as Rend Collective), have given us a different perspective of worship, and breathed great new life into the British industry with their creative and quite out-of-the-box folk/acoustic albums. With slower tracks like “Second Chance”, “Alabaster”, “You Bled” together with celebratory and upbeat moments of adoration and praise such as “Praise Like Fireworks”, “Build Your Kingdom Here” and “Movements”; The Art Of Celebration released around a couple of months ago. The album is promoted through the lead single and music video “My Lighthouse”, with Rend Collective maintaining their acoustic/pop/folk/worship genre and presence despite the change of their band name. 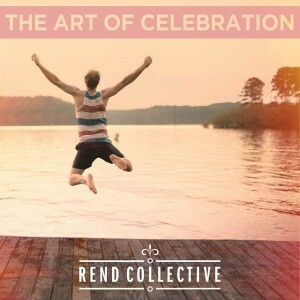 What is delivered in this 13 track album is a batch of songs fit for the singing in the church, for personal reflective worship, and for dancing and celebrating the sovereignty and faithfulness of our God; and with these different elements and facets in mind, Rend Collective’s popularity in the U.S. in worship music is sure to increase! The prophetic “Joy”, which actually makes me joyful when I sing it, starts of proceedings. With a sense of celebration, happiness, contagious vibrancy and effervescence; Rend Collective starts the album off with optimism and positivity as they sing across a strong acoustic guitar and banjo about freedom in Jesus Christ, and peace in the knowledge that ‘…we’re choosing celebration, breaking into freedom, You’re the song, You’re the song of our hearts…’. Though a little repetitive in the chorus, there’s no denying the intense energy of the band. To be joyous is to be filled with God’s presence and to know and realise that everything in our lives comes from God, and that ach circumstance that occurs ultimately draws us closer to God and to the notion that He is everything that w ned. He is our joy, and Chris passionately sings this fact out to perfection, building us up and giving us eternal truths to ponder over. Also with a remix added in at the end of the album, with an electronic undertone and pulsating drums, yet also keeping the tempo intact; Rend Collective have delivered us an inspiring opener with plenty of emotion and character, and one that could be a radio single in the future, bringing hope and joy to many! One of my favourite songs of 2014, Rend Collective have also included the lead single “My Lighthouse” on the album, also recorded twice (once live), as Chris and co. sing about Jesus love, comparing it to a lighthouse guiding us safe to shore, guiding us through the storms of life like Jesus calming the storm in the New Testament. Injecting a moment of sheer enjoyment and fun into the album, as can be seen on the creative and well produced music video; we are met with soft acoustics and earnest vocals (and also the very unique jingling jolly played by Garth), as this acoustic song gives us courage and reason to declare than even in the toughest of times and the hardest of situations, that Jesus is our refuge whenever we call His name, even when we don’t feel like we’re worth saving. One of my favourite parts of the song (and video) is that it seems that there is an abundance of new and unique instruments, yet the Northern Irish band, though breaking new ground musically, still maintain their identity as a band in Jesus, sounding slightly more musically mature in this album, and giving glory to God through everything they do. Also present as a live version at the end of the album, with Chris doing a pretty good Needtobreathe impression, and the crowd also being immersed in the lyrics and music of this Holy Spirit anointed track; “My Lighthouse”, along with “Joy”, serve up as album highlights of The Art Of Celebration. Though at times not sounding musically inventive as the entire album is folk/acoustic/pop/worship, Rend Collective do give us God breathed moments, and songs to warm our soul and stir our emotions, as we praise Jesus with all of our might. “Burn Like A Star”, jammed packed with a variety of instruments, may seem crowded musically yet works with its simple chorus. Encouraging us to shine our light, and show people Jesus through our actions and the unending love of God, that pours out from us to our friends, neighbours and colleagues. Reminding me of the part in the Bible where we are encouraged to be the salt and light of the world, I am gently reminded through the chaotic and frenetic nature of the song, that we can be Jesus to everyone around us, in fact this song actively inspires me to step out of my comfort zone and burn like a star and light a fire in the hearts of the people around me, for the glory of Jesus Christ. The mid tempo country like track “All That I Am”, is driven by fervent acoustic guitars with mesmerising whistles and claps, and also sounds something like it could have been sung in front of a campfire. As vulnerable as can be, the band surrendering all to Jesus, and promises God to be all that we can be with His help. In contrast to the structured acoustic song, the repetitive yet never boring acoustic guitar driven folk tune “Create In Me” sounds like a spontaneous song from Jesus Culture or Bethel, yet still maintains the essence of worship to God. Remaining me of the story of the Potter and the Clay in the Bible, “Create In Me” reassures us that even if we believe that we’re dirty and not good enough for God, that there is hope, that God takes us as we are, yet also moulds and shapes us as well to the people He wants us to be. All throughout this album, there seems to be that sense of rejoicing and the freedom to sing praises to God without any fear or reservations. This is certainly true in the remainder of the tracks, some of which include poignant and vulnerable lyrics and themes that tug at my heart and soul. With Rend Collective exploring the concept of Jesus overcoming death and us being more than conquerors, being able to do greater works than Jesus did because of the cross and resurrection as a result (in the traditional hymn like banjo, and acoustic guitar led strong and musically colourful ballad “More Than Conquers”); singing with reverence that Jesus is all we adore, that ‘…there’s nothing greater than Your love, You’re more than we can imagine, there’s nothing sweeter on this earth, You’re more than we can imagine, our hearts respond to who You are, it’s You oh Lord that we adore…’ (in the musically simple slow tempoed acoustic guitar led then synth focused electronic praise and worship song “Immeasurably More”); and also about the topic of freedom, driven by the acoustic guitar in the ballad friendly track and radio friendly “Finally Free”, similar in concept to Nichole Nordeman’s song of the same name; it’s clear that the name change has enhanced the band’s way of thinking, with Rend Collective releasing their strongest batch of songs yet, and most vulnerable and enjoyable! While the straight up synth and electronic led worship anthem and personal highlight “Strength Of My Heart”, relays to us that Jesus is strong and mighty, with Chris ardently crying out his praises to the Almighty that has set us free; and the musically simple “Simplicity”, driven by calm and captivating acoustic guitar, directs us to lay down our lives, and humbly offer God everything so that He can direct us into the places He wants us to go; it is the pseudo titled track song “Boldly I Approach The Art Of Celebration” that blows me away. The favourite song from the album; the band start off with a soft undertone driven by keys, and fervently and graciously approach God’s sovereignty and majesty with a song of thanks, recognition and appreciation. Opening with haunting, mysterious guitar, that later swells with a near flawless crescendo, ending as an orchestral anthemic piece worthy of respect and applaud; there is something just God breathed in this passionate and emotional melody that eloquently proclaims that Jesus is with us forever. As Chris cries out in the chorus ‘…boldly I approach Your throne, blameless now I’m running home, by Your blood I come welcomed as Your own into the arms of majesty…’, to me that is the pinnacle of the song and what epitomises and personifies the heart of the album. Singing out to God about communing with and worshipping Him; Rend Collective have record a fantastic song and an overall stirring and moving album, deserving of repeat listens! Just as good as Homemade Worship For Handmade People; this album is sure to change people’s lives, as we give God the glory in a folk/acoustic/worship/traditional Irish setting! As I have listened to their 3rd studio album many times, each time bringing a smile to my face; it’s clear that Rend Collective bring so much lyrical and musical creativity throughout these 13 tracks, injecting fun, joy and life into worship. Rend Collective’s presence in a CCM industry that could be stale in worship within a few years; is definitely more than welcome in my opinion, as the band from Northern Ireland continue to impress and encourage me to worship with abandon! A standout album in March as well as in 2014, this is a must for anyone wanting to worship God, but craves musical variety in an industry generally filled with sameness! Well done Chris, Gareth, Ali, and Patrick for reminding us that we can celebrate our Lord Jesus Christ every day, and soak in His loving embrace, walking in the promises He has for us!